With Standard & Poor’s in the process of adding Enterprise Risk Management (ERM) assessments to their credit scores, and other agencies likely to follow, organizations look to ERM programs to help achieve business goals. Working with Aon’s team of ERM solutions experts helps your organization make the most of opportunities that implementing ERM represents. Aon’s ERM solutions team helps you better understand your risks and how they are interrelated. We analyze from an integrated perspective, exploring the interdependency of risk relationships within an organization. Our goal is to create an Enterprise Risk Management plan to mitigate the specific issues that confront your business. Following the string of corporate scandals, government regulators, investors, boards, market and credit analysts, activists and auditors alike all have an interest in risk-related issues. Aon delivers risk-management expertise and understanding of solutions that meet the demands of these various stakeholders. An ERM plan looks across the entire organization to add substantive value. 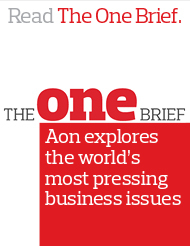 Aon’s ERM approach looks at performance and compliance issues, tangible and intangible assets, obvious and discrete exposures, and the risk-related links between them. An ERM plan is most effective when it is embedded into an organization’s day-to-day activities. A comprehensive and efficient solution to identify and measure risk enables you and your organization to act more quickly and with intelligence and confidence, ensuring you make the most of opportunities as they emerge.